From rivers to lakes to ocean, there are plenty of incredible bodies of water in Alaska to fish. A favorite spot to cast for the casual fisherman, no matter what’s running, is from Orca Island Cabins. Guests at the cabins have access to complimentary fishing gear, so there’s no need to worry about planning in advance or carrying extra equipment. Our waters are filled with a variety of fish – including rockfish, flounder and sea bass – all summer long. In July and August, silver and pink salmon will be running as well. For those more serious about fishing, a number of sport fishing charters in Seward will pick up and drop off our guests right from Orca Island Cabins for a half or full day of fishing in either in Resurrection Bay or outside waters. These guided fishing tours often double as wildlife cruises with sea life sighting opportunities from nearly every angle. Those in your party who want to relax on the island can stay behind; and those who want to fish to their heart’s desire can pursue a day of adventure at sea – a win/win for all. 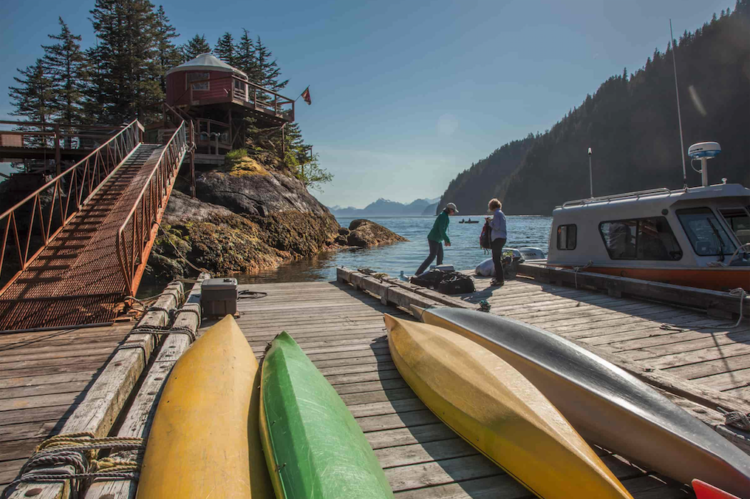 We can’t picture a more perfect day than fishing in pristine waters all morning and afternoon, then coming home to a cozy, private yurt to grill up freshly caught rockfish tacos or salmon and halibut fillets. Any fish pairs quite nicely with a view of the bay and the midnight sun. Better yet, you can wake up the next morning and do it all over again.